A Matter of Balane Coach Training - Ardent Solutions, Inc. 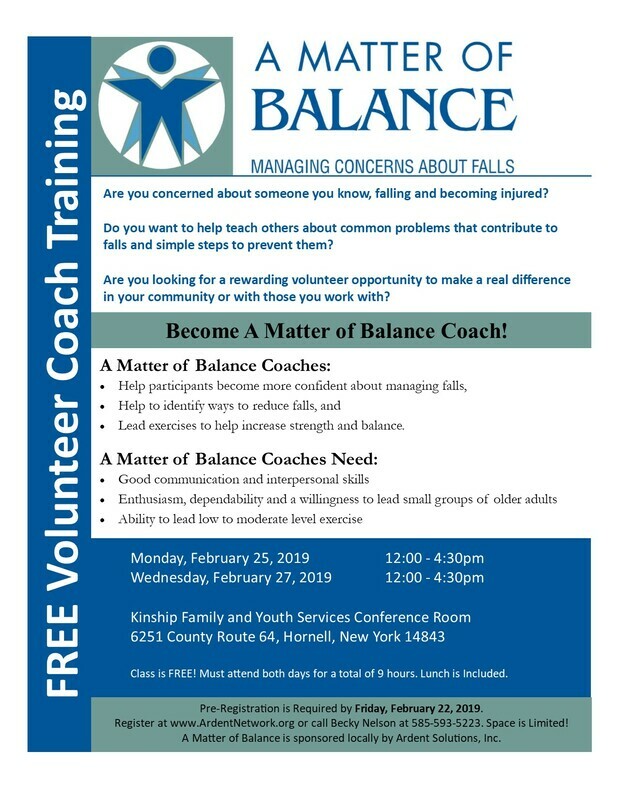 The "A Matter of Balance" Coach will lead community members in the A Matter of Balance: Managing Concerns About Falls Program. Each A Matter of Balance Coach will lead a minimum of two (2) A Matter of Balance classes within one year of Certification and will directly follow the A Matter of Balance curriculum while encouraging interactive discussion within the class about the program’s goals and objectives. Complete all initial training requirements and annual update training; including eight hours of coach training to earn the Matter of Balance Training Certificate. Maintains confidential information and materials related to program participants; including signing an annual “Pledge of Confidentiality.” Confidentiality and communication will include participants’ emergency contact information; and Injury, Illness, and/or Damage Report. Prepare for each class by reviewing the Matter of Balance manual and materials. Present the class according to the directions, training and materials provided through the Matter of Balance Curriculum. Utilize Matter of Balance Trained Professionals for technical assistance and guest speaking engagements. Confirm classroom supplies and refreshments with MOB Master Trainer. Monitors attendance and connects with each participant for evaluation purposes. Demonstrates and coaches exercises outlined in the Matter of Balance Program. A Matter of Balance Volunteer Coaches must have excellent communication and interpersonal skills. The coach must demonstrate dependability and interest in working with older adults. The individual must be willing to lead small groups and share life experiences as related to the curriculum. Education or healthcare experiences a plus. The coach must be enthusiastic, reliable and have the ability to perform a range of motion and low level endurance exercises. "A Matter of Balance" community-based programs will be scheduled in a variety of venues across the region to accommodate communities in need. Travel may be required along with a valid driver's license. Interested in attending an upcoming Volunteer Coach Training? To learn more about becoming an "A Matter of Balance" Volunteer Coach, please contact Erin Gorham.